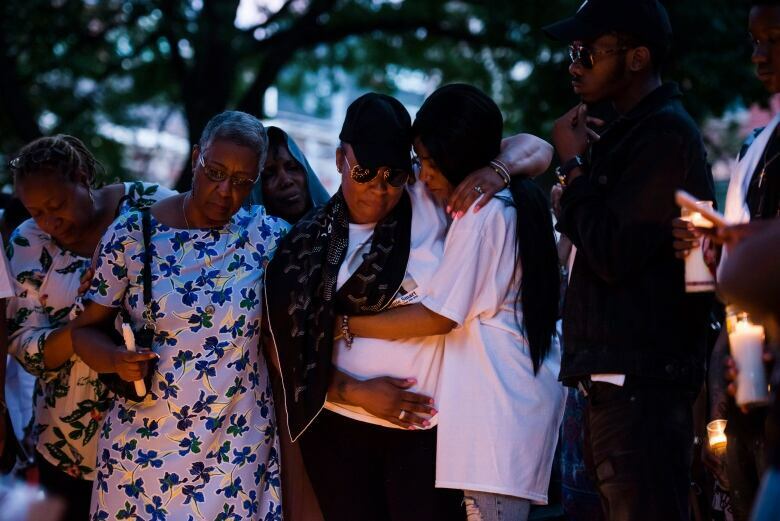 More than 100 family, friends and music fans attended a candlelight vigil Monday to mourn the death of Jahvante Smart, a Toronto rapper known as Smoke Dawg, who was gunned down on Saturday. Smart, 21, and Ernest "Kosi" Modekwe, 28, were shot to death on Queen Street West, near Peter Street, shortly before 8 p.m. A woman was also injured amid the gunfire, which erupted in a bustling area near the city's entertainment district while it was still daylight. Police have yet to release any details about potential suspects. 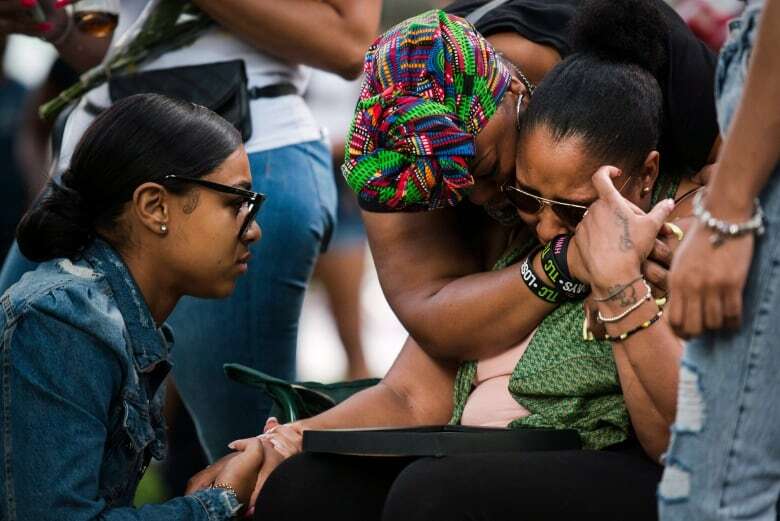 During the vigil, held in the park outside the Metropolitan United Church at Queen Street East and Church Street, family members laid pictures at the base of a tree. Many people lit candles and sang along to a recording of Smart's music. "His music will live through everybody else," said Brent Tappin, a family friend. Cate Galle said she had known Smart since they were in Grade 3 together at Nelson Mandela School. "He had this awesome attitude and smile — it was ginormous," she said, smiling as she remembered her friend. Galle said growing up in Regent Park there was always the fear of gun violence. 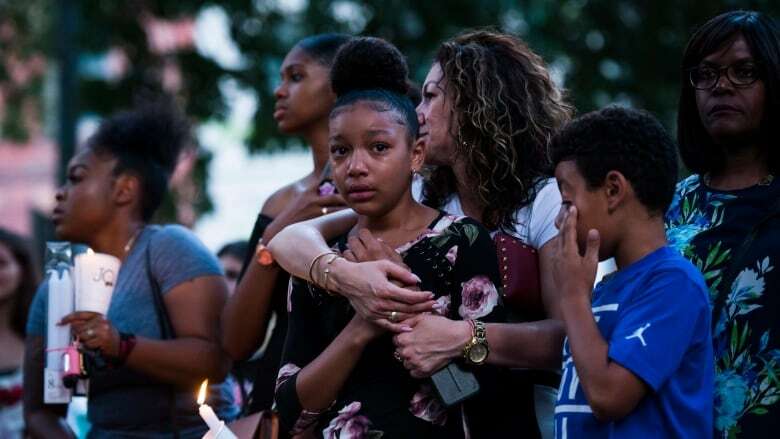 "That's kind of the daily thing you gotta worry about, can't go home too late at night and just watch where you're going, be careful," she explains, adding whenever she hears about a shooting "You don't want to think that [it's] someone you really care about." Smart had a one-year-old daughter and grew up as part of a large family in Regent Park, according to a statement released by his family and management. "As a young man from Regent Park, he overcame poverty and grew into a responsible caring grown man who took care of his friends and family," the statement said. "He helped people wherever he could and will be remembered for his huge smile and glowing personality." "Jahvante touched the lives of many fans not only in Toronto but around the world," the statement said. Last year, Smart toured Europe alongside Drake. 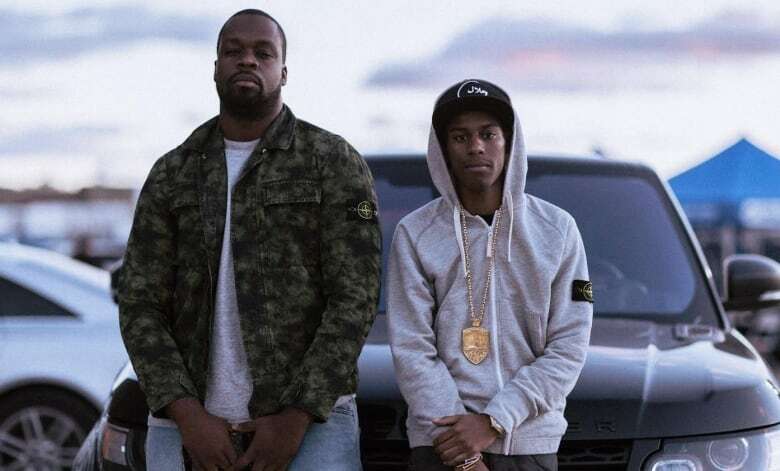 At home, the performer, who was part of the group Halal Gang, is credited with helping create a "Regent Park sound," according to music journalist Jake Kivanc. Smart's family said his music "was able to let him travel the world and chase his dream of becoming a super star." A vigil was already held for Modekwe, a brand manager who helped with merchandise sales for the Toronto hip-hop music collective Prime.